There are plenty of movies (and plays and books and real-life examples) out there to constantly remind us that dysfunctional families aren't exactly uncommon. But Nebraska takes a close look at one of these such families and makes the statement that although some families definitely have their problems they can still all love each other regardless. 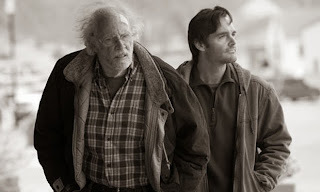 Nebraska opens with an old man walking down a busy interstate at a slow and steady pace. He's then picked up by a police officer and taken in where he is picked up by his son, David. Apparently the old man, named Woody (played by Bruce Dern), was trying to walk to Lincoln, Nebraska to cash in a winning million dollar prize that he received in the mail. Only the letter is spam. But even after listening to his son and his wife trying to tell him that he's crazy, they keep finding him wandering off towards the highway. David then decides, what the hey, why not just drive his dad to Lincoln and get the whole thing over with. 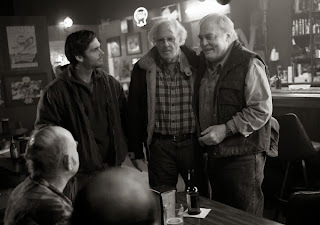 The rest of the movie follows them as they slowly make their way to Lincoln, stopping in Woody's old hometown, where they learn about the value of money, old grudges, and family ties. Movies like this take me a while to chew on. I know it's a little childish, but I usually have an aversion to anything that takes place in the Midwest. While the bleakness of the landscape and the rough, introverted nature of the people is perfectly executed through the black and white film (and really, it's made pretty stunning through this stark contrast), there's something scary to me about miles and miles of nothing but plains. I really just can't imagine living in a place like that. That being said, the landscape almost defines all of the characters. In a land where nothing happens, what could be more exciting than someone you know winning $1,000,000? This proves reason enough for family members and old friends to try and strong-arm the silent old ex-drunk into lending them money (that he doesn't have!). Good thing his kid's there to try and set them straight! Despite the movie's bleak themes and emptiness, the incredible actors really pull it together. A family dynamic that makes you cringe (and chuckle) in the beginning, makes you smile towards the end. Director Payne and the three main leads all commented during the press conference the comfortability that they had with each other during filming, and it definitely show's in their on-screen relationships. 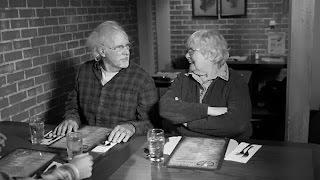 The son, David (played by Will Forte) is so sweet and patient, balancing his gruff of a father, and the mother (played by June Squibb) is the hilarious shrew that ends up giving the movie a dynamic that it wouldn't have without her. 7 outa 10. Really ends up being a gorgeous movie in its own way, and full of tongue-in-cheek laughs about the Midwest.